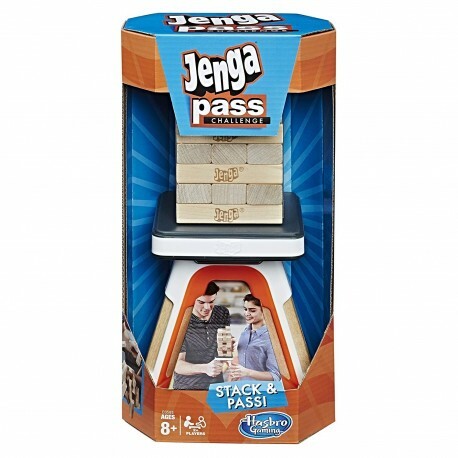 Take the classic Jenga game " off the table" with the Jenga Pass Challenge game. Stack Jenga wooden blocks on the platform to build the tower then remove one block at a time while holding one of the platform handles. It takes a steady hand when removing the blocks and passing the platform to opponents…be careful or the Jenga tower will come crashing down! Be the last player to successfully stack a block and pass the platform without causing the tower to crash. The platform has two handles and comes with a stabilizing stand. Enhance gameplay and try all 10 challenges included in the game guide, such as Blind Block, Chopstick Challenge, and Flamingo Fumble. 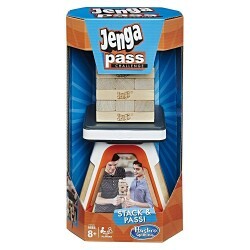 • Includes 27 hardwood Jenga blocks with resealable plastic storage bag, passing platform, stacking stand, and instructions. • Take the classic Jenga game " off the table"